Feed as the sole ration for a single therapeutic treatment at the rate of 1 pound of feed per 40 pounds of body weight for animals up to 200 pounds. For animals 200 pounds or over, feed 5 pounds of feed per head. 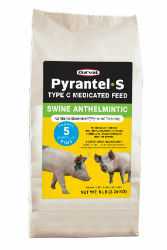 Pigs will generally consume this feed within a few hours, after which regular feeding should be resumed. Better worming is achieved when pigs are separated by size into different lots or pens for treatment. Water should be made available to animals during fasting and treatment periods. Consult your veterinarian for assistance in the diagnosis, treatment and control of parasitism. Grain products, processed grain by-products, plant protein products, calcium carbonate, sodium chloride, monocalcium phosphate, L-Lysine, roughage products, iron sulfate, zinc sulfate, copper sulfate, manganous oxide, dried Pichia pastoris fermentation extract, vitamin E supplement, niacin supplement, d-calcium pantothenate, sodium selenite, vitamin A acetate, riboflavin supplement, menadione nicotinamide bisulfite (source of vitamin K and niacin), vitamin B12 supplement, vitamin D3 supplement and ethylenediamine dihydriodide.